I always travel with a quilt. I think it has something to do with being used to sleeping under a quilt at home. I tried to take a photo of this quilt (one of my favorites) with the sun rise in the background. I'm still trying to figure out why I can get up to see the sun rise here and that doesn't happen at home. Since you couldn't see either the sun rise or the quilt in the other photo, I took two separate photos. From our deck it looks just like the mountain opens up to let the sun through. Here is a better photo of the quilt. Here is the view from my deck today. It's just beautiful here. Yesterday I visited two quilt shops and will share photos with you soon. I'll share my pattern for this quilt in a future post as soon as I draw it up in Electric Quilt. I just finished the binding in the car on the drive here. Over the weekend I visited The Quilt Box in Dry Ridge, Kentucky. The ladies there were very friendly and allowed me to take photos of their shop and the surrounding grounds, so I thought I would share them with you. This room was filled mostly with reproduction fabrics. The far wall and the wall to the right were full of beautiful batiks. Here are the shelves in the same room looking at them from the opposite direction. The number of bolts was overwhelming. In the right of this photo is just a small fraction of their shirtings. I'm not sure I've ever seen so many bolts of shirtings in once place before. And they had Mettler thread which is my all time favorite for applique'. This display is their 50 weight but they also carry 60 weight (which I prefer). I love this display of little quilts. This is their classroom. Behind the bright quilt you can see that this was an old log cabin by the chink and mortar system they used to put the logs together. The classroom looks inviting with this huge fireplace. That is a Lori Smith pattern hanging on the mantel. Upstairs there were quilts for sale. They were displayed as if I'd stepped back in time. There was lots of old furniture. There's a twin iron bed and an old Singer treadle sewing machine. The table to the left looked like it had just come from an old soda shoppe. Love this old church pew and wooden baby cradle. And, the painted wooden horse that looks like a quilt. The grounds were just beautiful. My husband had me walk around to the side of the shop to look at these flowers. These are hollyhocks. When I was very young, we used to pick a blossom and tie a long piece of grass around it about an inch from the top and pretend like it was a doll wearing a big flowing dress. This deck out back and a picnic table out by the pond are there for shopper's use if you want to bring along a picnic lunch. This was just a nice place to spend a few hours. The Quilt Box has a Facebook page. If you are ever in this part of the country, this shop is worth looking up. I've been tidying my sewing space and took time out to make these two tag blankets. One is for my grandson to play on when he visits here, and the other is for a gift. I used Cuddle on both sides of the blankets with a textured Cuddle on one side. My tutorial showing how to make these blankets is located here and on my sidebar under tutorials and patterns (Taggie Baby Blanket Tutorial). You can also use cotton or flannel on one side or both. 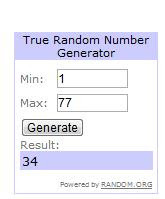 Congratulations to the two winners of my giveaway. The winner of the 100 charm squares and pattern is number 7, Terry of Terry's Treasures blog. And, the winner of the Schibbles pattern and charm packs is Pokey of Pokey Dot Quilting blog. Thanks to all of you for your nice comments and for stopping by to visit. I've written more than 300 posts on this blog, and I have over 300 followers. Welcome to my new followers. And to those of you who have been following along for awhile, thank you for being here. I appreciate each and every one of you stopping by to visit. So I've decided to have a giveaway for my followers. 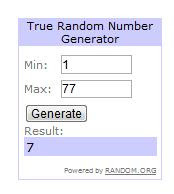 I'm going to choose two winners using the random number generator. The first winner will receive 100 charm squares I've cut from my stash and a pattern from the Red Button Quilt Company. 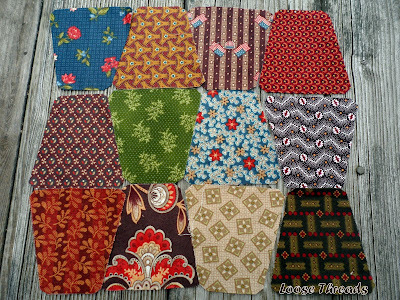 The charm squares are all reproduction fabrics or fabrics I would use in a repro quilt. The pattern doesn't show up too well in the photo, but there are little stitcheries in the center of each churn dash block. I'll send the second winner these two Moda Butterscotch and Rose charm packs and Schnibbles pattern. Any of the Schnibbles patterns by Carrie Nelson of Miss Rosie's Quilt Company. Are you still working on the baskets from the book, When the Cold Wind Blows? One charm square will make a basket. Are you working on tumblers? Maybe you have a hexagon project in the works. A five inch square of fabric is enough to make a block for most of these projects. All you have to do to win is to be one of my followers (or become one) and leave a comment to let me know what you would do with these charm squares if you are the lucky winner. The giveaway will close on Thursday at noon. Now that I have a new Grandson, I have been thinking more about decorating for the holidays. Even though Daniel will be too young to really enjoy this Halloween, I found these Halloween pinwheel blocks I'd started and decided to work on this quilt. I think the quilt is a bit busy, but I'm going to put the 1/2" black sashing between all of the blocks and maybe a black border. Hopefully that will tone it down some. Any other suggestions? Here is how it looks with just the first round sewn on. I'm making these pinwheels from two 5" squares- one background and one Halloween print. Put right sides together and sew around all four sides. Then cut twice on the diagonal as shown. When they are pressed open, they will look like this. Your 4 half square triangles for your pinwheel block are right there together. Rearrange and sew. This is also a good way to use those charm squares. I'll link this tutorial on my sidebar in case you want to find it again. I hope you're all finding some time to stitch today! My continuous bias binding tutorial is featured today on the Sew What's New blog. I hope you will go over and take a look. The link to my tutorial is on my side bar under Tutorials and Patterns or you can click here. I can't believe it's been a week since my last post. I've been sewing a few stars for my Phebe quilt. I'm auditioning this sashing fabric and trying to decide whether or not I want to fussy cut those little red 1" cornerstones. I've cut lots of fabric and made block kits to sew more stars. I've also cut enough fabric segments from my bags of 2 1/2" strips to make block kits for my Leftovers Quilt so that it will be 8 X 10 blocks. I've also been spending time with my favorite guy, Daniel. He's a little over 4 months now. In this photo he is focused on the yellow light on my camera.